In a blender, combine all of the above ingredients except the chocolate frosting. Dip the rim of the shot glass into the chocolate frosting to coat it. You can also add sprinkles if you want. Pour the banana split shake into each shot glass. Garnish with a banana slice and straw! Enjoy. If you're anything like me, growing up you ordered a banana split for dessert at every dinner your parents would let you. It was hard to resist three scoops of ice cream, a banana, whipped cream and a whole bunch of sprinkles! As an adult, I rarely order them anymore... actually it's been years since I've had one! So when I made these Banana Split Shooters (adults only!) I was pretty excited! They're not only adorable, but they're absolutely delicious. Using Yoplait strawberry frozen yogurt, a banana, vodka, Betty Crocker chocolate frosting and some colorful sprinkles you can easily make a banana split shooter!! Your guests will totally enjoy the cuteness and flavor! Here's what you'll need to make these delectable little shakes. First, prep your shooter glasses. Dip the shot glass about 1/4 inch deep into the creamy chocolate frosting. Blend the yogurt, banana, vodka and cream together. Fill the shot glasses with the banana split smoothie. Rim the edge of the glass with festive sprinkles and half of a banana slice. 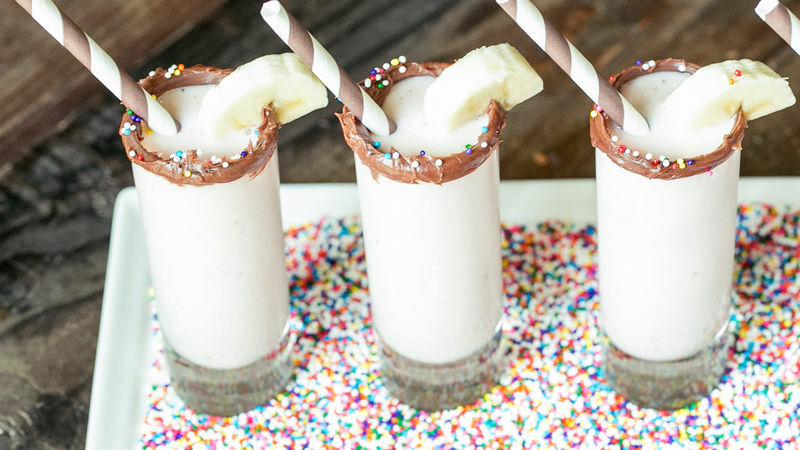 Enjoy your boozy banana split mini shake!